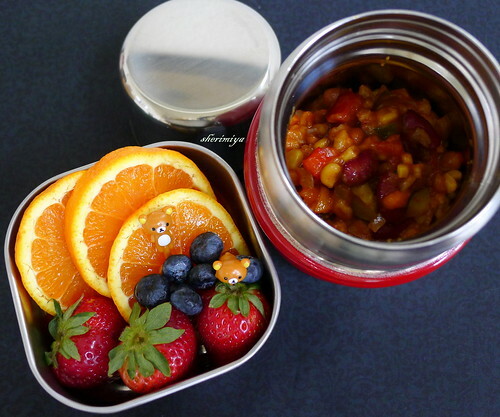 Veggie Barley Chili Thermal Bento, a photo by sherimiya ♥ on Flickr. Is it just me, or does it seem like one thermal bento after another? Next up in the rotation is veggie chili. 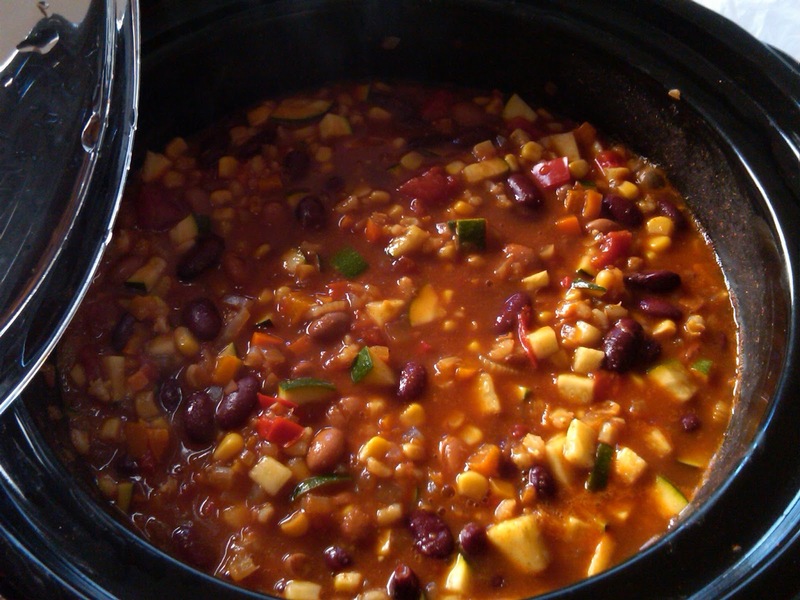 This one uses a lot of the same ingredients as my basic chili recipe here, but I made this batch in my slow-cooker and added barley and corn (and omitted the hominy and chocolate) to change it up a bit. Also, I didn't have time to watch the pot at the stove since there were three activities going on this day: Mad Science Afterschool Program, Ballet, and Kung Fu. It sure is nice on days like this to come home to dinner already-cooked and the house smelling delicious. The kids get a hot chili lunch along with some fresh fruit on the side. A welcoming bento on a cold rainy day! Barley seems an interesting addition to the dish! 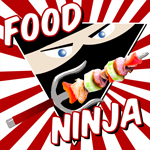 A touch of scandi cuisine to a Mexican favorite :). I didn't realize barley is Scandinavian. It's not especially popular here, but I love the chewy texture. I think I'll start adding it to other stews and soups. So hearty and filling. I forgot to mention the Rilakkuma picks I got from my sweet bento friend... I love them! I am not sure if it is scandi but barley was widely used before the rice arrived to this lands. Most of the dishes that include rice were made with barley in the "old times".